Sales of Destin FL homes increased more than 25% for the first quarter of 2010 when compared to the same time period last year. The increased demand is also exerting pressure on home values as the average sales price was $435,715 or 17% higher than last year. Other key statistics are listed in the table below. 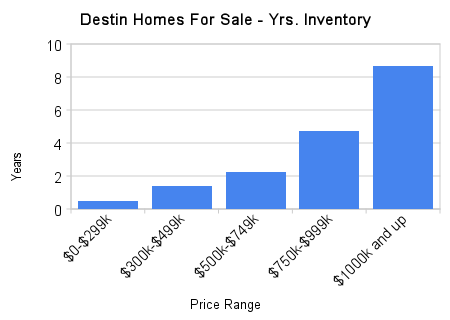 The increase in sales came as the number of Destin FL homes for sale declined. In other words, homes in Destin are selling faster than new listings are coming on to the market. 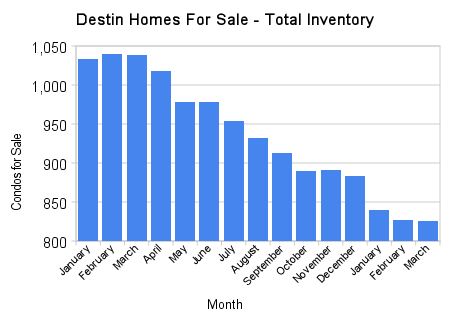 This trend is especially prevalent in the lower price ranges where inventory for Destin FL homes is almost below 6 months now. However, the luxury price ranges aren’t fairing as well and inventory levels exceed 8 years for homes in Destin FL priced above $1M. I field many calls each week from buyers looking for Destin FL homes that are bankowned (REO’s) or short sales. While these can lead to great “deals” there are many Destin FL homes for sale from “normal” sellers. These sellers typically own their properties free and clear and are able to sell at today’s market values. In fact over 61% of sales in the first quarter came from these sellers while Destin Foreclosures and Short Sales only accounted for 39% of the total market. Buyers: Homes in the lower price ranges are selling faster than new homes are being listed. There are still some good deals available but time is running out. There are fewer homes available so you must be ready to move quickly and aggressively when you see something you like. Buyers: Homes in the higher price ranges are stagnant. You have a great selection of quality, location, and size available to you right now. This won’t last forever and the best homes will be bought first. You can negotiate aggressively on both price and terms being more aggressive as you go higher in price. The key is figuring out which seller’s are motivated. Sellers: If you are selling a home priced below $400k, make sure you are pricing within recent comparable sales. While the market has improved in your favor, conditions are still not strong enough for you to be overly aggressive. Sellers: If you are selling a home in the upper price range, lower your price! The market is still extremely weak and you must be extremely aggressive to sell.